Family law can be a messy profession. Between acrimonious divorces and bitter custody battles, the terrain is often rocky and difficult to navigate. Family lawyer Margaret Klaw discusses her experiences with Steve Kraske. In the first part of Thursday's Up to Date, we talk with a lawyer who’s spent nearly 30 years balancing these types of battles. We’ll discuss how family lawyers stay detached from the raw emotions of their cases, why she sometimes feels like she’s a therapist for her clients, and why personal grievances should stay out of court—even in a divorce case. 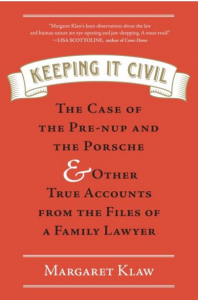 Margaret Klaw is the author of Keeping It Civil: The Case of the Pre-nup and the Porsche & Other True Accounts from the Files of a Family Lawyer. She is a founding partner of Berner Klaw & Watson, an all-women law firm located in Center City, Philadelphia, dedicated exclusively to the practice of family law. Named by Martindale-Hubbell as a “Preeminent Woman Lawyer,” she has also received the designation of Pennsylvania “Super Lawyer” in the area of family law for the past five years. Margaret has chaired both the Family Law Section and the Women’s Rights Committee of the Philadelphia Bar Association, and is currently an adjunct professor of family law at Temple University’s Beasley School of Law. She speaks frequently on family law topics and writes for The Huffington Post, DailyWorth.com, and her own blog, FamilyLawUnraveled.com.